Stars Over Washington: 2018 Midterms' Syzygy Moon shows Blue Revolution! 2018 Midterms' Syzygy Moon shows Blue Revolution! September 28, 2018: yes, the Syzygy Moon chart prior to the November 6, 2018 Midterm Elections is in the conservative-preserving money sign of Taurus, the bull. And yet...in the horoscope below, upper right, you see how revolutionary, rebellious Uranus @00Tau31 Rx snugs against the IC of the chart, the HOW? Point and Basis or Foundation of the Matter. And there's We The People's Moon conjunct Uranus which denotes excited people particularly women, plus, as noted on the chart, the Moon-Uranus pair suggests potentials for 'a sudden manifestation of subconscious forces (such as the Collective of the American people); those with special aims, and/or female reformists. So...Lunation Uranus conjunct lunation IC = incumbent loss, or as I prefer to put it, A Blue Tsunami! 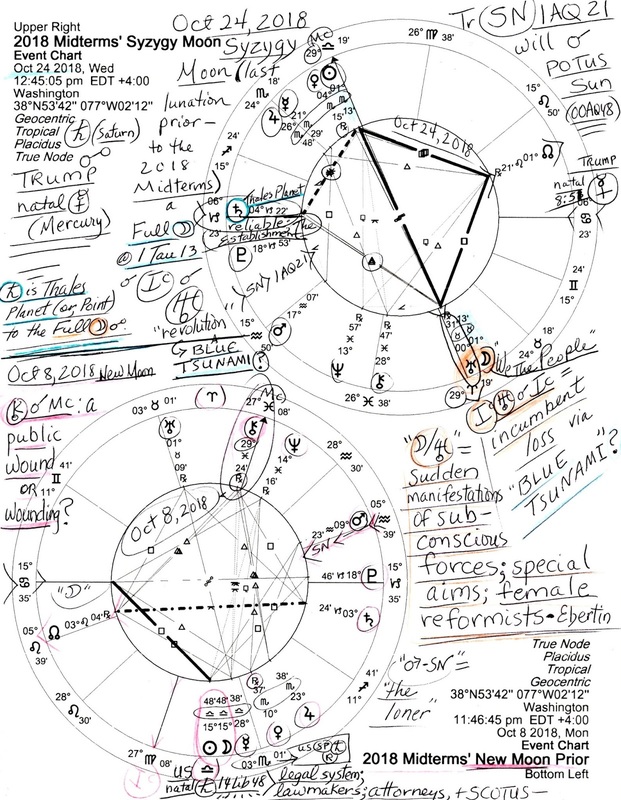 Plus, you see the Oct 24th Full Moon light spilling out onto the public (North Node in Leo, sign of natural leadership and point of public contact) and the 'Tail of the Dragon', South Node, almost conjunct US POTUS Sun which in 2017, fell @00AQ48 = Trump playing the role of POTUS. The Dragon's Saturnian Tail will swipe or smack US POTUS Sun, the Presidency, on October 27, 2018 (horoscope shown). Now I'm quite certain the ruling patriarchs, many of whom are advocates of Puritanism of a most hypocritical kind (I know because apparently I have Puritan ancestry as do many of us), (marvel at Chuck Grassley's stone face) won't agree that their current Koch (Murdoch-Mercer-foreign-govts) task of shoving the US government toward the regressive 'right' is unacceptable to a vast majority of Americans but I believe that this is the case. For who in her right mind would ever choose to live under a totalitarian, draconian, bossy regime led by a decrepit group of what seem to be the 'top choice' of global criminals in the bunch plus their political operatives and handmaidens? For more Oct 24th chart details see The Syzygy Moon of the 2018 Midterms. Anyway, with optimism for America I'm reaching out to the planets of the chart/s, above, for aid for our nation! We need it because, lower, left is the the New Moon Horoscope of October 8, 2018 @15Lib48 (conjunct US natal Saturn 14Lib48 suggesting a new cycle starting with the goal of undermining further of the US legal system including the US Supreme Court) so that the American public is left with no US institution or branch of government to depend on as before (to the extent that we could). Our best opportunity to re-create some level of balance in our governmental system and support the Republic is to take part in a Blue Tsunami by Voting Blue on November 6, 2018. 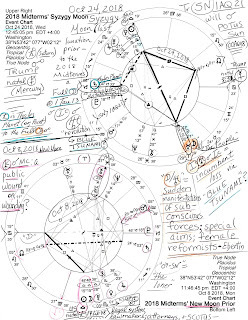 For, as you see in the October 24th chart, The Establishment planet Saturn rises in his own sign and is the Thales Planet or Point aiding both the Sun and the Moon during their opposition, a sign of fulfillment or culmination of a plan seeded at the October 8, 2018 New Moon conjunct US natal Saturn--our 1776 Saturn exalted in Libra, sign of the Scales of Justice--now unfortunately progressed into Scorpio and retrograde since 1996 when the authority of the US Presidency came under attack by the same forces that continue to sabotage our nation today. To me, true patriotism must involve protecting our nation from outside infiltrators and foreign criminals who would rule us with No Consent From The Governed--precisely the opposite of what America was and is meant to be. Is it time for compromised politicians to spill the beans on who intimidates them and to begin naming names? That may never happen but what we can do is to Vote on November 6th--all the ladies and the younger generations 18 and older will be there, carrying their surf boards no less! I would agree it could be a Blue Wave, but with a Pink Tsunami!